You’re on a road trip, enjoying yourself with your family when it happens. That most dreaded and feared of inevitabilities when on the road. The event that we all must face yet would not wish upon our worst enemy. The dreaded dead zone! For whatever reason, there are just long stretches of seemingly normal land that all phone and internet signal is seemingly scared of going anywhere near. Not even data will help you here. So, what can you do to pass the time now? Simple, you do things old school. 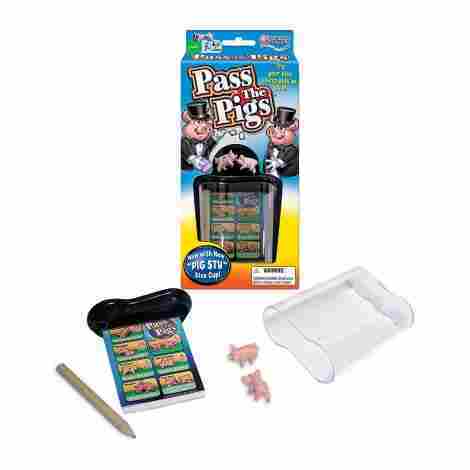 Kicking off our list, we have the Winning Moves Games Pass the Pigs game. This is a simple game to understand, as all travel games are. It’s essentially a game of dice, only with pigs instead of normal dice. So how does it measure up when compared to more complex games of its kind? Let’s take a look and see. If there is anything that a travel game needs to get right, it’s to be fun and to be a time sink. Just like how large open world video games give you several singular tasks designed to take a very long time to complete. And this game accomplishes this brilliantly, constructing a clever risk and reward system that encourages players to risk losing the progress they’ve made so far for the potential reward of gaining more points. The player only switches turns when they want to, so as long as they don’t roll the “pig out” or “oinker” positions, they can just keep racking up points. Got a sibling or three? Our condolences, but at least you all can play this game when the signal gives out on that long road trip (with the prize perhaps being who gets to use the 3DS afterward). Because of the way this game is structured, as many people as you please can play this game, though the recommended number is 2-4. Considering that this game consists of a cup, two plastic pigs, a paper, and sub-par pencil, it should come as no shock that it doesn’t cost you that much to buy. So, if you need a fun, cheap alternative source of fun when traveling, this is the one for you. In second place is Regal Games with their Travel Bingo Set. Bingo is easily one of the most stereotypical games for traveling, second only to eye spy. However, that is for a very good reason, which this game exemplifies. Most bingo games are a set of letters or numbers, but this bingo game takes full advantage of the surroundings they’re meant to be used in. 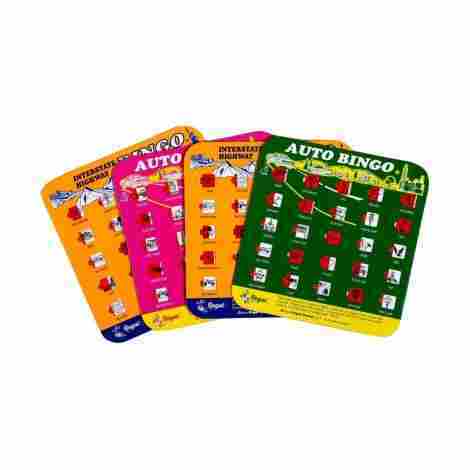 The reason this bingo game comes in a set of four is to cover as many types of settings as possible, as the subjects for each bingo section is a location or landmark. This will keep your kids constantly entertained and interactive with the world around them. You’re probably wondering where the pen or pencil is in this set since that is typically how these games are played, with the players marking down their bingo points with a writing apparatus. However, these bingo sheets remove that hurdle from the equation entirely, by having fingertip shutter windows that can be opened and closed for reusability. So, you don’t have to worry about going through all of your bingo sheets in one sitting. This set of sheets costs about the same as the previous entry, which is really good when you need more than one means of distracting your kids on long car rides where the internet is not always reliable. Hasbro, the uncontested masters of the toy line. From toys to board games to whatever else, if kids play with it, then Hasbro has dabbled in it at least once. And one of their all time classics is the game of Simon. And this mini version can be taken anywhere you, please. Don’t think that just because it’s a smaller version of the game that it’s made with inferior hardware or won’t be as fun as the larger version of the same game. 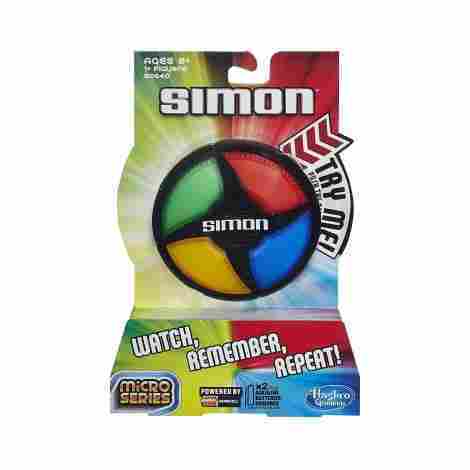 This mini Simon may be portable, but it will test your child’s skill and memory retention just as ruthlessly as your average game of Simon. With other games on this list, there’s typically only one true way to actually play. But with this, you have two options for whether you’re playing solo or with friends. You can either challenge Simon on your own to reach the maximum score or pass it along to someone else whenever a mistake is made. While being an electronic game means it costs a bit more than the previous entries, especially if you take into account the cost of buying batteries so you can play it, the price is still very affordable for what it’s offering. 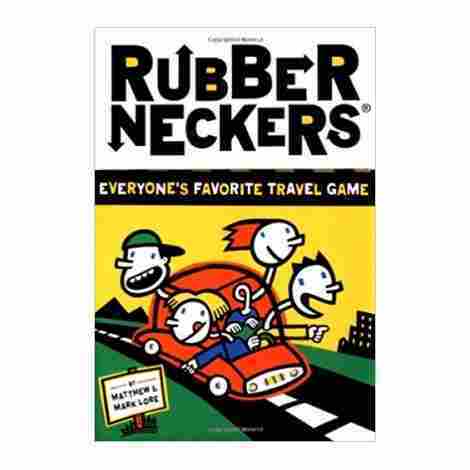 Coming in at #4, we have Rubberneckers: Everyone’s Favorite Travel Game. While the placement of this item on our list would beg to differ on that, we cannot deny that it’s still a very fun game for the family who loves to have fun together on a long trip. This is another truly excellent time sink on a list full of the same. Staring out the window to watch cars pass by is usually considered to be the last resort for kids on road trips and can actually make the trip seem longer. But by giving them something to actually look for, this game can make the time go by faster for bored children on car trips. This is probably the priciest entry so far, but that really isn’t saying a lot. You’ll rarely actually be paying much for a travel game, and this is no exception. 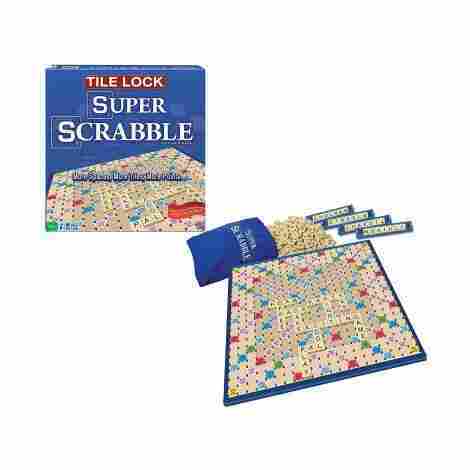 For our #5 entry, we chose Winning Moves’ Tile Lock Scrabble Game. Scrabble is one of the most deceptively fun games out there. Trying to pitch the game to someone who’s never heard of it before is akin to trying to convince someone of the philosophical stimulation that comes from watching paint dry. However, as this game will demonstrate, there are few games more intellectually stimulating than a round of scrabble. Playing a game of Scrabble in the car likely sounds like a recipe for disaster, and if you're using any other model than this one, it is. However, this model uses a unique tile lock design that keeps every tile placed on the board locked in the place in which you put it. Great for when you really don’t feel like searching for that one A tile that fell under one of the seats. Playing on a plane? In the car? In a hotel? This game will serve you and your whole family well regardless, because of its compactness and ability to be taken anywhere you need it to go. And with over 100 pieces and four tile racks for each player, the whole family can get in on the fun. And once more we climb a bit further up the price ladder, but still remain safely in the affordable price range. 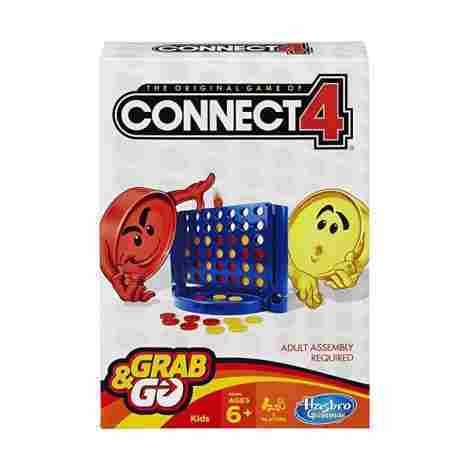 Coming in at #6, we have our second to final Hasbro entry with the Hasbro Connect 4 Grab and Go. Though Hasbro, whom we maintain are the uncontested masters of the toy and board game, only get three entries on this list, we chose these three because we feel that, out of all of them, they are the best. Allow us to clarify why that is. This game’s setup includes the red and yellow checkers, both of which have 21 pieces to their name, and the playset you put the checkers in throughout the game. Storage is actually made incredibly efficient with this board game because of the fact that the playset and the tray the checkers land in are combined together and can be folded up for more compactness. Although it’s just as easy to drop and lose track of these checkers as it is with, let’s face it, all connect 4 checkers, the bright primary colors that these checkers sport make them a lot easier to find against the dull colored floor of your car. At least when compared to the equally dull colored letter tiles of the scrabble game previously. Taking a step back in terms of price, this board game will cost you much less than the previous two or three entries do. 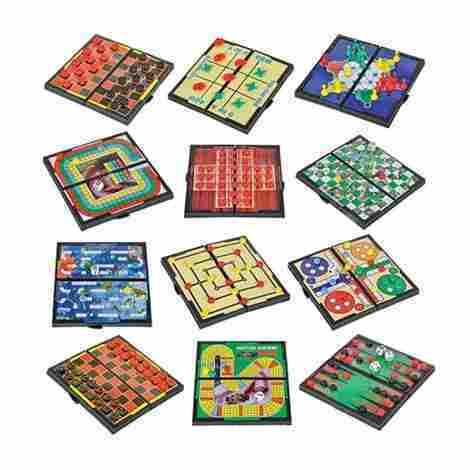 At #7, we have the Gamie Magnetic Board Game Set. Playing with a single board game, especially for particularly long car rides, can get incredibly boring if the games aren’t designed to last for long periods of time. This is where Gamie compensates by having up to 12 board games at once. The benefits of which being as follows. These games are all incredibly easy to carry around with you (and if you don’t want to bring one or two along, you don’t have to) and are all completely different games from each other. From checkers to Chinese checkers, to tic tac toe and more, if your passengers get bored with one game, they can quickly move onto another. Not only does the magnetic nature of these game boards make them incredibly easy to keep track of (the many many game pieces, not so much) but they’re also made of incredibly durable materials for game boards. While not invincible, they can take considerably more punishment than other entries on this list. These are easily the priciest travel games we’ve covered yet, and it isn’t hard to see why. 12 game boards, each with their own set of game pieces, all of which are made from premium materials. It’s no wonder that, while still very affordable, these boards are still very pricey for this list. Kicking off our final three entries, we have All Things Equal Inc. with their Loaded Questions On the Go game. The best way to describe this game is that it’s a family friendly cards against humanity. Now whether or not you’ll personally get anything out of it depends on whether or not reading that made you cringe in revulsion. But nonetheless, we still recommend this game to the family of jokesters. The main difference between this game and Cards Against Humanity is that loaded questions puts it on you to answer the questions presented on each flash card. And with over 200 questions in total across these flash cards, your family is sure to have a gut-busting car ride the whole way. The way to keep score on this game is incredibly simple. One person, with a pen and paper, must tally up how many answers each person can come up with for each question, with the person able to come up with the most answers being named the winner. While a little more expensive than the average price range we’ve seen so far, this game is still incredibly affordable. For our second to final entry, we have our last Hasbro offering with their Yahtzee to Go Travel Game. Yahtzee is a game that you either adore or never were able to figure out. But no matter which side of that spectrum you sit on, this is a great game to play on the road. 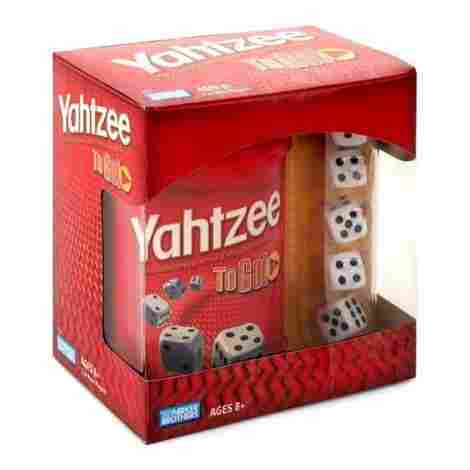 All you need to play Yahtzee are the dice, a piece of paper to keep score on, and a cup to roll the dice around in. that’s it. Even if you lose track of everything else but the dice on this list, you can still enjoy a fun game of Yahtzee. Which makes this game great for the forgetful kid who might not realize they left half of their game back at the hotel, 7 hours back. It can be hard to keep track of a game of Yahtzee because of the number of small pieces involved and how the point of the entire game is to throw those pieces around and watch them roll to a stop. Fortunately, carrying these pieces around is easy, thanks to the container they come in having a screw on top that keeps everything in the same place securely. This game of Yahtzee stands at a very average price for a game like this, especially since it includes its own set of pen and paper. 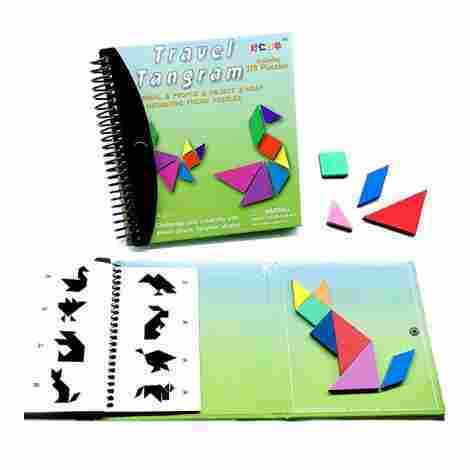 For our final entry for this list, we have the Wallxin Tangram Magnetic Puzzle Game. Puzzles can be a great way to pass the time, but the problem is that there really is only one way of putting them together, then you’re done. But a magnetic puzzle has several distinct advantages here, which we shall go over now. While yes, this puzzle game comes with a booklet detailing over 170 possible combinations into which you can assemble the pieces, you’re mostly encouraged to play with and assemble the pieces in any way that suits you. The guides are just there to provide you with a general idea of how to assemble each piece, but the rest is up to you. But the enjoyment of a magnetic puzzle game is measured only by the variety of pieces available to you. And this game has more than enough pieces for you to make almost anything you want. Sure, because of the small size of the magnetic surface, you can’t make anything too complex, but for what it is, you have a surprising amount of options available to you. This could easily cost quite the pretty penny, but for a travel game, this is a very average price. Which, of course, makes it a very good deal given what you’re getting out of it. It’s safe to say that you won’t need a travel game for very long if the need arises for one. Your kids have more means than ever to keep themselves entertained, and internet dead zones are only going to be fewer and farther between as time moves on. On top of that, kids have phones with which they can call their friends, handheld gaming systems that give them hours of content, and downloadable songs and movies that pick up the slack when the internet gives out for miles of land. And yet despite all of this, travel games have endured. Oh sure, as we said, they are nowhere near as lucrative a business as they used to be, but they still hold on, even to this day, and that is not a fluke. There are many reasons for this, of course, all of them holding equal amounts of water as the other. But if you’re looking for a good travel game to share with your family on a long trip, then these ten entries will suit you just fine. So just pick one or two that you think your kids will enjoy and have a fun trip. Assembling a list of criteria for this list was a bit tricky. Toys, by their very nature, are widely varied things that serve several different purposes. And while specifying this list down to travel games made things a bit easier, that still left a lot of different branching pathways for this list to go into. Fortunately, we managed to dilute all of those various digressions into one cohesive list of criteria for evaluation. So, with that said, here are the criteria we used to judge who got onto the list and how high up. Though this list is technically in no particular order, we couldn’t not put this one first. Above all else, a game should be fun. It’s the only way that you’re going to convince your kids to choose the travel game over their 3DS. We looked for games that were notoriously fun and addictive to play and had factors to that fun that lent well to the act of traveling. But above all else, they just had to be entertaining games. This is why the only puzzle on this list was a magnetic puzzle made up of abstract shapes that could be put together in multiple different ways. Because then you could have more fun with it. But there’s another side to this coin, of course. When playing a travel game, on your phone, or doing anything while on a long car ride, the key idea here is how much time you manage to consume via this activity. This criterion is just as important, even more so in some aspects than the previous one. Because you may be looking for fun with a travel game, but you’re also looking for a means with which to pass the time. There are many different ways of going about this. Some games like to go what we call the “Grand Theft Auto approach.” The game gives you a single function that can be applied in multiple different ways over and over again or a single task that’s fun to do but takes time to do it, such as with the rubberneckers game. Other games, like our #1 pick, base their game around a risk and reward system, that has reliably drained casino-goers for generations. Basically, it gives you the means to progress further than everyone else, but with the equally high risk of screwing up and losing all the progress, you’ve made already. The challenge is inherently enticing to some people, especially kids, and especially if there’s a goal to reach at the end. Obviously, no money is offered or lost, but for a kid, it can be the most enthralling thing on the planet. Time consumption is of top priority with travel games, which is why some are better at making that transition into travel game territory than others. There’s also one last factor that plays easily the biggest part in how long a kid will spend playing it. This is about as self-explanatory as it gets. If you want your kid to be playing that travel game for over an hour, then that game better lend itself to being fun to revisit over and over again. This is why it’s so tricky to add in games that require sheets of paper to keep score. Eventually, that paper is going to run out, and unless you brought a backup stack of copy paper with you just in case, then that game is officially over. A travel game needs to be one where there is no problem finishing the game and then immediately starting over, which is why games like Simon and Connect 4 were the best of Hasbro’s toy and game library to transition over into travel games. They’re games that are quick to start and quicker to restart once you’re done. Do you want to know what can very quickly ruin any game? Losing track of the game pieces. This is why most attempts to bring, say, chess to the travel game market in any form other than as a handheld game have been abject flops. When the pieces are the most important aspect of a game, bringing them into a moving vehicle with plenty of places and opportunities for the pieces to fall off and get lodged in somewhere you won’t find until ten years down the line is probably not the best idea. However, this quickly became a necessary evil we had to deal with in order to even have a list at all, so instead, we judged the entries by how many pieces there were. Which is why the 12 board game set got to put so low. There’s no way you’re going to keep track of all of those pieces. Our final criteria for this list was the price of the game itself. This was a very easy criterion to work with, in stark contrast to other lists where the price is a lot more complicated. As always, we judged each entry by how well they justified the prices they were asking for, but considering the fact that travel games, by their very nature, don’t cost all that much, this was not a hard issue to grapple with. It isn’t hard to justify someone paying money for your product when the price is just short of the price of a happy meal at McDonald’s. For our final segment for this article, we’re going to look at frequently asked questions about Travel Games. While the questions we found concerned nothing life threatening, they’re still important questions that need to be discussed and gone over in a detailed fashion. As such, here are the most commonly asked questions about travel games, and the answers thereof. Q: Why should I even get these for my kids when they have phones and handheld gaming devices to keep them entertained? A: There are two reasons for this, the latter of which can depend on how old the child in question is. The first reason is that phones and gaming systems have battery limits, and if your kid is young and thus using your phone, then you need your phone to maintain a good charge when you’re out on the road, in case of emergencies. The second reason is that if your kids are younger, then you want to give them as much real physical playtime as possible, and that includes when on the road. It’s also an excellent means of bonding with your kid since you can join in too. Q: I have three kids and only enough spare change around to afford one of the items on this list. What kind of toy do you recommend for this scenario? A: Generally speaking, it all depends on what kinds of kids yours hypothetically are. If your kids love playing together, then a few rounds of rubberneckers should hold them over nicely. If they love competing, then get the Simon mini. The great thing about games like these is that there is a solution for pretty much every problem and the scenario you could run into. From introverts to extroverts, from one kid to four, we made sure to fill this list with entries that catered every type and number of kid. Q: besides travel games, what other alternatives can I seek out to help my kids pass the time that doesn’t involve video games or the internet? A: The biggest one is to take them to a bookstore and help them pick out a book for them to read. You’re never too old to get into reading and depending on the age and reading level of the kid in question, this could end up lasting them the entire trip. If your kid has toys, let them bring some of them along, two or three should do them just fine. Q: What types of games do you recommend taking on a plane ride? A: Okay, for this, you need something that isn’t intrusive, but is still fun and time consuming. This is where mini chess sets actually tend to thrive since you’re sitting still in a vehicle whose movements are (ideally) significantly less bumpy than driving on a dirt road. Now you and your kids can simply focus on the fun of the game without having to worry about a bump sending all the pieces everywhere and completely ruining it. You should definitely avoid games like Yahtzee on a plane, though, since you’re more likely to send the die flying under a seat, and planes aren’t generally considered the kind of spaces you can just go crawling around looking for dice in.